Continue talking!! Here's the place... A new 99 pages for us to fill up. yeah...something hinky with the link...I clicked on bonnies name...went to her latest topic to get here...and here I am! For some reason the link doesnt bring you here, so i went to ourresort group and found homechat 8...never mind im here now. Got a 2 hour early marh as they want me to use up some time in leiu so no dishes for me today!!!!!!! The quilt is beautiful Bonnie, im with nina how can they not love it. Sorry about the link... I think I've fixed it now. I got the brilliant idea to put a row of small granny squares in my afghan... spent the entire day making 13 of them and weaving in ends. Now I am hand sewing them on. Once they are on I can just pick up and crochet off the opposite side of them. So time consuming: WHY DID I DO THIS?? I spent the whole day and I'm not even sure I really like it. I might have just spent an entire day doing something I am only going to rip out. :evil: MAD at myself. Just a plain ripple afghan is a great user-upper of stash! You can mix different stuff and it all looks good. But these granny square ripple afghans... fagedaboutit. Wish I did. they see me knitting all the time, so what's the big deal? 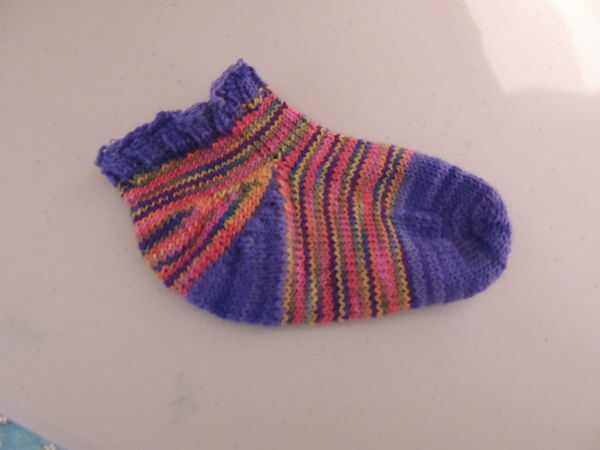 "mom can just make another one"
Had tiny amounts of sock yarn leftover in my stash.. so I made one baby sock.. so far.. Second sock syndrome has kicked in.. lol... took less than a day..
sooooo sweet! I can almost smell that sweet new baby smell! dd wants a chevron patterned headband, with a flower attached....any of you up to designing a pattern? knit or crochet...you know...pattern for dummie kinda pattern?